A set of British chamber depth gauges of casehardened steel for 10ga, 12ga, 16ga, 20ga, 28ga and .410. Chamber Depth Gauge - A cylindrical plug of hardened steel, precisely machined in relation to the standard dimensional specifications of a given cartridge, engraved with circumferential lines demarking the different typical lengths of cartridges generally available for that bore. By inserting the appropriate bore's plug-gauge into the chamber, one can read off the line indicating the nominal maximum length of the cartridge which should safely be able to be shot from that gun (provided, of course, the gun be in sound condition). 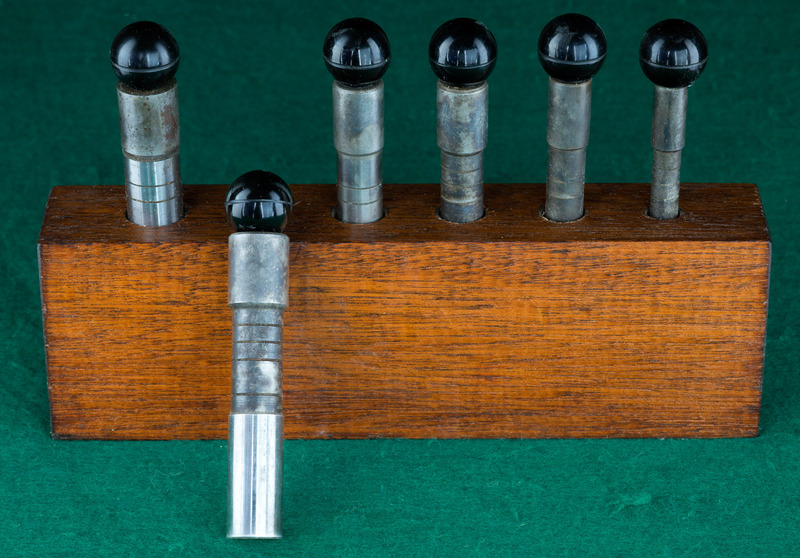 The above pictured gauges accurate operation depends upon the standard internal bore diameters for which they were intended, in this case, British. Many pre-war German guns have nominal bore diameters tighter than British standard .729 inches (in a 12 gauge). So, using a set of British gauges to measure an early German gun would likely give an erroneous reading.